Can the Zetas comment on this video? http://www.youtube.com/watch?v=A8Y5aZnRk00&feature=related This was posted by Steve on the Australia watch blog. It looks like something similar to a German concentration camp in the war, and is situated in the tourism capital of Queensland in the Gold Coast. 1). Is this a "Fema" style camp that has been setup to control the common man prior to or just after the PS? 2). What are the Elite thinking in regard to population control prior to PS in Australia, and I do understand that Martial Law could be instigated. Are there more train stations ready to go like this one, with simple extra barricading and presto another camp? What is the significance of a prison being built around a train station used by civilians, in Robina, a tourism capital on the Queensland coast? Play out the scene after the 7 of 10 sinking on the Sunda Plate occurs. It will by that time be clear that our predictions are correct, and those standing between the Pacific Ocean and the Indian Ocean can anticipate horrific sloshing during the pole shift. Those with the funds to travel, tired of standing in flood water that never seem to drain, will decide to take a trip to Australia. Is Australia to change their travel visa policy overnight, applied to all, because the percentage of those trying to sneak into the country has increased? Migration in disguise as tourism will increase, and when it does so, those who come from flooded regions, who look suspect, will be detained and returned. According to this article NASA has postponed until Saturday November 26 launch Mars probe, named: Mars Science Laboratory (MSL), which carries a vehicle for exploration of the planet, named: "Curiosity". Recently a Russian satellite sent to Phobos, was not successful, the reasons explained by the Zetas. Both Russians and Americans seem to be very anxious to explore and go to Mars and its moon Phobos, this NASA satellite trying to send this Planet X? [and from another] http://www.nasa.gov/mission_pages/msl/index.html The launch of a United Launch Alliance Atlas V carrying NASA's Mars Science Laboratory (MSL) has been delayed one day to allow time for the team to remove and replace a flight termination system battery. Rollout of the Atlas V to the launch pad moves to Friday, Nov. 25. The rest of the week's briefings and events are being reevaluated and a new pre launch schedule will be issued on Monday. [and from another] http://www.nasa.gov/missions/past/index.html Viking 1976: The lack of organics was a big surprise from the Vikings. Mars Global Surveyor 1996-2006: Its camera has returned more than 240,000 images to Earth. Pathfinder 1997: The landing site, an ancient flood plain in Mars' northern hemisphere known as Ares Vallis, is among the rockiest parts of Mars. Phoenix Mars Lander 2008-2010: Data from NASA's Phoenix Mars Lander suggest liquid water has interacted with the Martian surface throughout the planet's history and into modern times. Looking at the Mars missions history one can see an intense interest from 1996 when the Global Surveyor and landed Pathfinder were launched, through 2010 when the Phoenix lander finally gave out. This intense interest followed the 1983 confirmation that Planet X existed and was inbound. This was according to our predictions which had been given to MJ12 that it would arrive in 2003. The closer it came, the more NASA determined to explore Mars as a possible safe spot to ride out the pole shift. Until 2010, they had information, but clearly "curiosity" remains, and thus the newest probe to be launched, dubbed Curiosity. In the late 1990's the elite anticipated assistance from Service-to-Self aliens who had been lying to them about the potential of assistance in their anticipated jump to Mars. When 2003 arrived, the elite were already aware that they had been hoodwinked but the hope of jumping to Mars, somehow, remained. That Mars has water has been confirmed. That it is capable of having an atmosphere, sufficient for hominoid visitors to breath, has been computed and confirmed by the ancient artifacts such as the Face on Mars left by the Annunaki. Those in the elite still "curious" about Mars are those who still hope that the Service-to-Self aliens will relent, and that some bargaining chip in human hands might make the deal. This will not occur, as the Council of Worlds will not allow it, but until the pole shift arrives those holding hope will not give up. It's only a month now to the next Christmas. The last Christmas marks the beginning of the 7 / 10 scenario of continuous plate movements. I think none of the sequences are 100% completed. In the last 12 months, just naming a few, we have seen the Brisbane flood and the inland tsunami in Australia; the Christchurch earthquake, Pike River mine explosion , Maui gas leak and recently the container ship Rena hit the Astrolabe Reef in New Zealand; landsliding and floods in Pakistan, India, Nepal, Bangladesh and now Thailand. These events have definitely shown the signs of rising and tilting Indo-Australian Plate and being driven under the Himalayas. However, this sequence is incomplete. We have also seen a lot of landsliding, flooding, earthquakes and volcano eruptions around the Ring of Fire especially around Japan, Indonesia, Philippines, etc. These are indications of sinking Indonesia and hence the folding Pacific. Again, this sequence is incomplete. Recently, we have also seen many earthquakes, landsliding and flooding around central and South America. In addition, North Amercia has started having unusual earthquakes near the New Madrid faults. Africa has also shown signs of rolling i.e. the recent earthquakes in Turkey. My question is: Can we expect the next Christmas Hammer to be more dramatic than the last as we draw closer to the back end of this 7 / 10 scenario i.e speeds up the 7 / 10 sequence? [and from another] http://zetatalk.com/newsletr/issue217.htm Lets compare to a December several years ago, prior to the big 9.5 quake in Sumatra on December 26, 2004. The Christmas Hammer started on December 20, 2010 with massive global shuddering at approximately 18:00 UTC, when the magnetic N Pole of Earth comes up over the horizon to face the approaching Planet X. For several days in a row (December 20, 21, 22, and 23) the hammer struck. Per the Zetas, 18:00 UTC is also when Planet X is positioned overhead, above the point where the Indo-Australia Plate is lifting and being driven under the Himalayas. It is thus positioned over Indonesia, where sinking is expected to start the 7 of 10 scenarios. The Christmas Hammer was notable on December 26, 2004, when the 9.5 quake along the curve under Sumatra occurred, on December 19-22, 2007 when large black seismographs occurred at the same time each day, and on December 20-24, 2010 when hundreds of quakes above magnitude 4.7 occurred on the Bonin Arc off Japan. Are we going to have a repeat this year? The Christmas Hammer is caused in great part by the December switch in Magnetic Trimester which occurs, as we have explained, at approximately December 17 on the Earth calendar. This forces a magnetic adjustment in all magnetic planets, and great stress on the Earth which is locked into a magnetic dance with Planet X. But beyond the switch in Magnetic Trimesters, there is the issue of the ongoing 7 of 10 scenarios. The plates are loosened up, such that plate movement in total is occurring regularly. Nancy has noted this in a recent newsletter feature, whereby quakes frequently outline a plate on all sides. They are greased and ready to slide! What happens when additional stress is placed on the rock fingers along the plate borders, additional jerking around due to a change in the magnetic neighborhood? Certainly, it won't be a calm time. The 7 of 10 scenarios will at a minimum be expedited. The giant statues of Easter Islands appear to me to be sculpted in the image of the Annunaki owing to their body sizes and head shape. This is in view of the Zeta's revelation that (unlike us humans) the Annunaki (whom the Zetas say do not sleep), have one brain hemisphere as opposed to our two; and therefore have elongated heads. My question is why have remains of this giant race never been found on the islands or did they practise cremation? Or are they an entirely different race we don't know about as no record of them like those found in Sumerian texts exist? All the attempted explanations I have read are not satisfactory. When Annunaki bones are discovered they are mistaken for human bones, as they are that similar. Although called giants, in the past mankind was shorter in stature than today. In almost all human races today males over 6 foot tall are routine, some even approaching 7 foot. In the past, as shown by the armor worn by knights in the Middle Ages in Europe, a height closer to 5 foot was normal. The Annunaki stand about 8 foot tall, and are very heavy boned and well muscled. Any Annunaki not cremated by his fellows would be a skeleton not intact, but strewn about by wild animals or eroded, laying on the surface. The statues on Easter Island are exagerated to look like the alien gods familiar to those in the South Pacific and S America. These are the visitors who did have elongated heads. Many human faces are elongated in a manner similar to the Annunaki. . I would like to ask such a question. Yesterday Russian President Medvedev made a statement on the deployment of missile defense in Europe. And today from the White House has already sounded the actual refusal to heed Russian position. Could our friends to answer - why in this issue again has appeared the tension between Russia and the U.S.? Who and for what purpose returned to this issue about deployment of missile defense in Europe? [and from another] http://www.usatoday.com/news/world/story/2011-11-23/russia-missile-defense/51365332/1 Russia will have to take military countermeasures if the U.S. continues to build the shield without legal guarantees that it will not be aimed against Russia. The U.S. has repeatedly assured Russia that its proposed missile defense system wouldn't be directed against Russia's nuclear forces, and it did that again. Medvedev warned that Russia will station missiles in its westernmost Kaliningrad region and other areas, if the U.S. continues its plans without offering firm and specific pledges that the shield isn't directed at its nuclear forces. The U.S. plan calls for placing land and sea-based radars and interceptors in European locations, including Romania and Poland, over the next decade and upgrading them over time. This is an old issue, from the Bush era. Poland and Romania agreed to house missile sites supposedly to point at Iran, but they would have to cross over Russian territory first. Such maneuvers are unacceptable unless the country being traversed agrees. For instance, when the US wanted to go to war with Iraq, Turkey refused overflight of bombers. Thus, the US had to fly from aircraft carriers in the Mediterranean, an extra burden. Is there some reason Russia is objecting? Does NATO have plans they are not revealing, not obvious on the surface? This is what Russia knows, though they cannot prove it without revealing their spies, and cannot address the issues without breaking the cover-up over Planet X! What stress will the anticipated European tsunami put on Eastern Europe, as refugees from the drowning UK and North Sea area are pushed from country to country? We have mentioned that these refugees will flow south to Africa, but they will likewise move east, trying to work around any closed borders that block their way. They will also move away from the flood. Then at the pole shift, this will flip around, with Russia becoming a broad sea during the two years following the shift, as waters inundate from the Arctic. No one wants more drowning refugees to accommodate, nor the crime that comes with such crowds overwhelming the police in a region. This issue is deemed one that will arrive on Russia's eastern borders. Thus, the bear seeks to have strong borders to repel refugees, and it is this that the missile bases will be trying to break. There is no way to put this other than in grim tones, as these times are in mankind's future. The tsunami refugees will in all likelihood be the lower classes who do not have the funds, the bank accounts, to establish themselves elsewhere when the tsunami washes away their lives. On foot, they will be pushed from locale to locale, blocked at borders and moving along those borders until they can flow into land ill prepared to block them. They would arrive in Russia. Eastern Europe used to be Russian territory, and thus the blockades were to the west in those former satellite countries (East Germany, Czech, Poland, Hungary, Romania, Yugoslavia, Bulgaria, Albania), not on the Russian borders. Russia will seek to block them, and NATO would seek to bomb these blockades. The logic is that the refugees, by the millions, would infest Russia, and eventually drown. Meanwhile, Russia would suffer. Most experts had cited only one surviving reference to the date in Mayan glyphs, a stone tablet from the Tortuguero site in the Gulf coast state of Tabasco. But the National Institute of Anthropology and History said in a statement that there is in fact another apparent reference to the date at the nearby Comalcalco ruin. The inscription is on the carved or molded face of a brick. The fragment of inscription had been discovered years ago and has been subject to thorough study. It is not on display and is being kept in storage at the institute. The "Comalcalco Brick," as the second fragment is known, has been discussed by experts in some online forums. The date inscribed on the brick "'is a Calendar Round, a combination of a day and month position that will repeat every 52 years." The third glyph on the brick seems to read as the verb huli, "he/she/it arrives." Both inscriptions - the Tortuguero tablet and the Comalcalco brick - were probably carved about 1,300 years ago and both are cryptic in some ways. The Tortuguero inscription describes something that is supposed to occur in 2012 involving Bolon Yokte, a mysterious Mayan god associated with both war and creation. Some read the last eroded glyphs as perhaps saying, "He will descend from the sky. "The Institute of Anthropology and History has long said rumors of a world-ending or world-changing event in late December 2012 are a Westernized misinterpretation of Mayan calendars. Unlike the headlines, neither of these objects refers to the Gregorian year 2012. The Tortuguero monument is a broken tablet that is interpreted to say that the god of war and creation will descend from the sky. There is no reference to 2012 or even a date! The Comalcalco brick in question likewise refers to something that will arrive. Again there is no reference to 2012 or even a date. 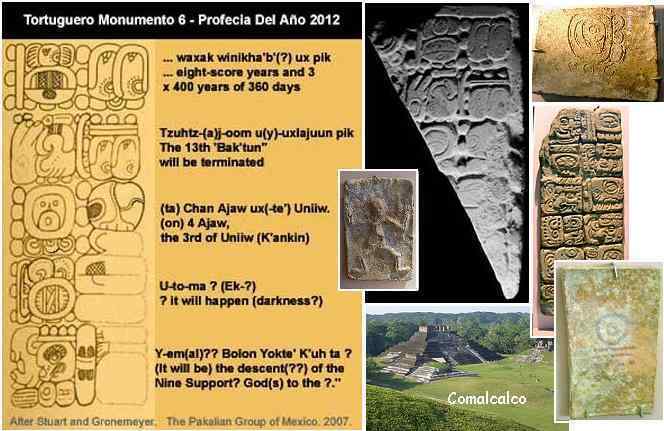 The Comalcalco brick has an estimated age of 1,300 referring to the Mayan holiday, and is interpreted to refer to the 52 Calendar Round, a Mayan holiday. We have stated before that mankind has incorrectly lined up the Mayan and Gregorian calendars. Record keeping goes to heck after a pole shift, and after hundreds of years survivors attempt to re-establish their holidays. So the Ceremonial Calendar cannot be used as a guide. The Long Count Calendar is without connection points to either the ceremonial or astronomical calendars. Mankind is used to thinking of the Mayan calendar like they do the Gregorian calendar, where eclipses and returning comets and planetary lineups are recorded along with the dates. The Mayan calendars have none of these. The age of one of the glyphs used to determine a connection between two calendars was carbon dated with a range of 3-5 years. How precise is that? So you have an ancient language no longer spoken or written so interpretation is a guess. You have a Mayan people practicing ceremonies today after a breach of hundreds of years so their ceremonial calendar is no longer a good guide and is a guess. You have glyphs whose date is a guess, established by carbon dating on wood which is imprecise or carved on stone which cannot be carbon dated. So you have a guess based on a guess based on a guess! All pointing, per those who want to sell books with 2012 in their title, to precisely December 21, 2012. Clearly something is pending, as per our prediction Planet X arrived in the inner solar system in 2003 and has been wrecking havoc ever since. Clearly the passage, resulting in a pole shift for Earth, a crustal shift, is pending. Even the Annunaki were not able to pinpoint precisely when their planet would return to your Sun. Any long journey results in variables, so the time can vary somewhat. We ourselves are not prefect in our ability to predict, though we are certain of the date of passage to within a 47 days period, and already know the year and trimester involved. As we have often stated, we are not allowed to reveal the date. 2012 was used as a magnet, so that discussions about the many prophecies, the End Time prophecies, could be pointed into the future. When the 2012 craze first began, years ago, this was far into the future and thus considered safe by the establishment, who want first and foremost for their slave classes to tend to their jobs and not rush away from coastal cities. Where ZetaTalk was saying mankind should prepare now, move to their safe locations now, the establishment wanted the common man to think they had plenty of time to prepare. What will they do now that 2012 is upon them, and we are only at the start of the 7 of 10 scenarios? They will fog the issues, finding some reason to point into the future. .